Two decades ago the poet Robert Bly published a book that stayed on the New York Times Bestseller list for sixty-two weeks and changed a generation of men. Based on an ancient fairy tale, Iron John became an allegory for midlife men in search of an authentic life. I was part of the men’s movement launched by this poet and the book I wrote at that time, Death of a Hero, Birth of the Soul, became one of its bibles. This same army of 38 million men is now marching into their retirement years largely unprepared for what aging really entails or what to do with the next twenty-five years of unprecedented longevity gifted them by science and medicine. Boomers, of course, believe that they will conquer this stage with exercise, attitude, and nutrition. As their problems and defeats multiply, however, aging men – and I am one of them – now discover that they are lost once again in an unknown land longing for another great story to guide them home. I have found that story. I am 82 years old. John's book offers a brilliant analysis of aging that enabled me to understand how I've aged and what is left for me. I commend it to all men who are interested in their own aging process. Understanding offers comfort. 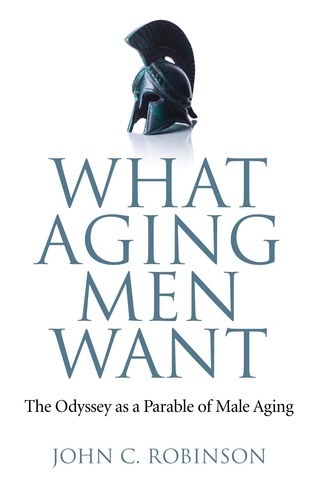 What Aging Men Want: The Odyssey as a Parable of Male Aging by John C. Robinson, Ph.D., D. Min. is a powerful, transformative guide to the inevitable personal odyssey all men must face: maintaining a sense of purpose and vitality while facing the effects of advancing years. What Aging Men Want dares to ask the question: “What if aging can be ‘…a radically new, fulfilling and joyful time saturated in love and generosity, quite literally the blossoming of your life?’” It is a compelling question, approached with impeccable scholarship, sound psychology, a mythologist’s eye for universal truth, and the kind of straight-talking personal point of view authentic only to those with a wealth of first-hand experience. The premise of What Aging Men Want by John C. Robinson, Ph.D., D. Min. is that the universal stages of a man’s aging process correspond to specific chapters of Odysseus’ fabled return to Ithaca at the close of the Trojan War. While Robinson’s approach is so methodical and precise as to be virtually incontrovertible, the narrative is pleasingly conversational in tone and never patronizing. It is clear that Dr. Robinson seeks not to assert his credentials among a jaded body of peers, but rather to extend a compassionate invitation for fellow men struggling with fear and doubt to drink freely from his font of hard-won and carefully considered knowledge. It is virtually impossible to imagine any man, regardless of wealth, privilege, level of education, or degree of life experience, for whom What Aging Men Want would not be a valuable asset. Each chapter of What Aging Men Want by John C. Robinson, Ph.D., D. Min. is formatted identically, with an introduction outlining the focus, a segment reframing the story in modern context, the author’s interpretation, points for discussion, and a closing challenge. Robinson then ends each section of this exceedingly well-crafted guidebook with Growth Questions which challenge the reader to apply learned insights in practical and personal ways. This consistency of design allows the reader to relax into the experience and extract every possible benefit from the wisdom within its covers. In much the same fashion as Odysseus of old, readers of “What Aging Men Want” by John C. Robinson, Ph.D., D. Min. will return to their former lives with a newfound sense of joy, purpose and self-worth. “What Aging Men Want” by John C. Robinson, Ph.D., D. Min. should be required reading for every man facing mid-life and struggling with impending mortality.